Roughly bounded by the Capitol precinct on the west, F Street NE on the north, 13th and 14th Streets on the east, and the Southeast Freeway on the south, with an expansion area south of the Southeast Freeway bounded by 7th, M, 10th, and 11th Streets SE. One of the oldest and most architecturally diverse communities in the city, Capitol Hill reflects the social diversity and economic growth of the early capital. It includes early residential development clustered near the Capitol and Navy Yard, and much late-19th and early-20th century housing for mostly middle-class workers. There is great variety of housing types, with elaborate ornamental pressed-brick structures adjacent to simple, unadorned frame buildings and small apartment houses. Many row houses were built either in long uninterrupted blocks or in small groups whose imaginative facades reflect the aspirations of the builders and residents. There are many fine commercial buildings, particularly along 8th Street and Pennsylvania Avenue, and notable religious and institutional structures. 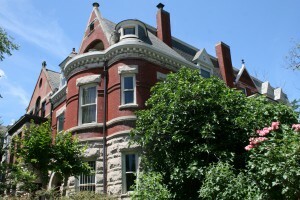 The predominant architectural styles include Federal, Italianate, Second Empire, Romanesque, Queen Anne, and Classical Revival. There are approximately 8,000 primary contributing buildings dating from circa 1791-1945. To see house histories associated with previous House and Garden Tours, click here. Research your home’s history with free searches of the Washington Post articles on the DC Public Library website. For tips on locating historic photographs, click here.